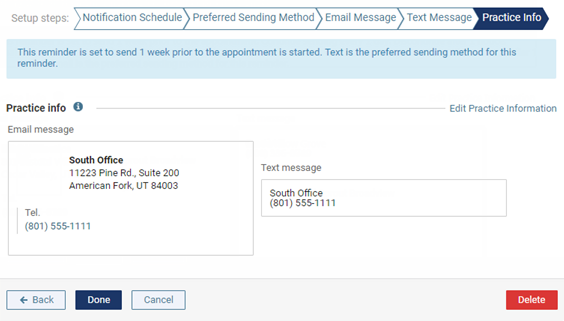 You can create an appointment communication (an email message and a text message that get sent to patients automatically regarding their appointments). 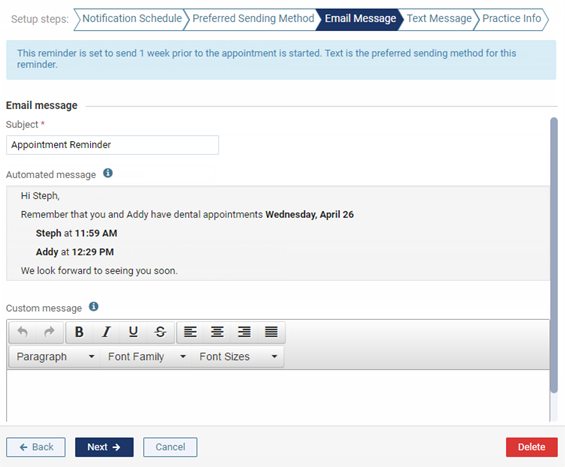 On the Appointment tab of a location's Patient Communications page, click (or tap) Create New. The wizard for creating a new appointment communication appears. Appointment Scheduled Date - When someone schedules an appointment. Appointment Confirmed Date - When a patient confirms an appointment from an automated appointment reminder, or when a staff member manually changes an appointment's status to "Confirmed." 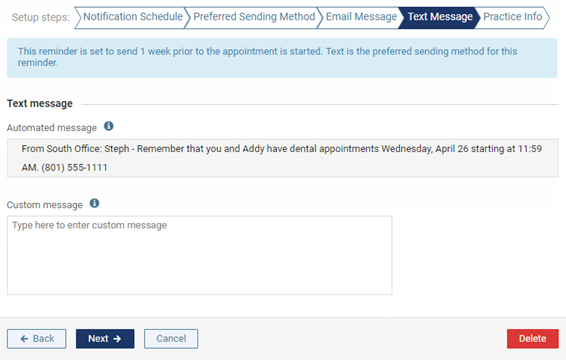 Note: Dentrix Ascend has a default automated text message that gets sent to patients after they confirm their appointments. 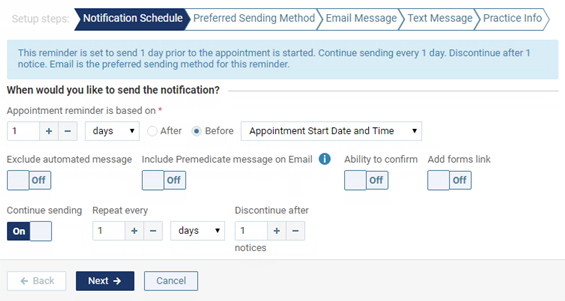 If you create another "Appt confirmed" communication and make it active, we recommend that you turn off the default one if you don't want your patients to get two messages for confirming their appointments. Appointment Start Date and Time - When the date and time of the scheduled appointment arrives. Appointment Completed Date - When an appointment's status is changed to "Complete." Appointment Broken Date - When an appointment's status is changed to "Broken." Appointment No Show Date - When an appointment's status is changed to "No Show." The rest of the options become available. Schedule - Specify the number of hours, days, months, or years before or after the selected action that you want the message to be sent. The Before option is available only for Appointment Start Date and Time. Include Premedicate Message - This setting is available only for Appointment Scheduled Date, Appointment Confirmed Date, and Appointment Start Date and Time. Turn this setting On to have instructions for the patient regarding pre-medication appear on the message; however, the pre-medication instructions will appear only if the patient's appointment has the option selected that indicates that pre-medication has been requested. Turn this setting Off to exclude the pre-medication instructions. The text of the pre-medication instructions is, "Please do not forget to take any required medication before your appointment." Ability to confirm - This setting is available only for Appointment Start Date and Time and if Before is selected. Turn this setting On to provide a Confirm Appointment button for a patient to click (in an email message) or texting instructions that a patient can follow (in a text message) to confirm his or her appointment. The status of the appointment will be updated automatically when the patient confirms his or her appointment. Turn this setting Off to not include a way for the patient to confirm his or her appointment from the email or text message. Continue sending - This setting is available only for Appointment Start Date and Time, Appointment Broken Date, and Appointment No Show Date. Turn this setting On to keep sending a patient this message at a specified interval (Repeat every ...) after this notice is sent out initially until the specified number of notices (up to 10) have been sent (Discontinue after ... notices). Turn this setting Off to send this message only once. When you add a "mobile" number in a patient's record. When a patient has a scheduled appointment coming up and has never received a reminder from your office previously.